The Navy Museum’s latest scholarship recipient, Kim Moore plans to look at how Māori culture has influenced, and been influenced by, the Royal New Zealand Navy. A Masters student at Auckland University, Kim was officially awarded the Royal New Zealand Navy Masters Scholarship in June. Established by the Navy Museum in 2015, the scholarship has a value of up to $10,000 per annum and is awarded annually to an Auckland University history student. The student must undertake a Research MA in a topic related to developing contemporary knowledge, or investigating the social or naval history of the RNZN. Kim explains that his project will, “analyse Māori experience and interaction with RNZN since WW2. I plan to use korero of serving and retired naval personnel and their family members, to identify the impact Māori culture has had on individuals and the Navy as a whole”. “I’ll ask questions about family and the working lives of Te Iwi Heremana including topics such as housing, education, sports and leisure. I’m particularly keen to look at whanaungatanga (relationships and interconnectedness); how culture is created, maintained and shared between generations while people are serving in the RNZN and after they leave. “I’m also interested to see if rank influences Māori culture and is culture expressed differently at sea than on shore i.e. Kapa Haka, use of Te Reo and waiata etc.” says Kim. Kim also plans to interview people outside Navy to see if and how the RNZN has influenced the lives of others within the wider community. Kim is delighted to be this year’s scholarship recipient. He is excited about producing research that uses history in a meaningful way and is relevant to the present day. 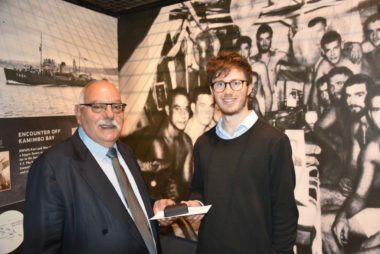 “Once Kim has completed his thesis in February next year, we’ll be working with him to find ways he can share his findings with the wider Navy community,” says David Wright, Director Navy Museum.